By recalling the commandment, “You shall not kill,” our Lord asked for peace of heart and denounced murderous anger and hatred as immoral. This is different from the feeling of anger, which is not sinful in itself. That anger is defined as “a strong feeling of displeasure or hostility.” We can’t control when we will feel angry, since that depends on events that occur outside of us. But we can control what we do about the feeling. As the Catechism of the Catholic Church teaches, the feeling of anger is one of the passions. “In the passions, as movements of the sensitive appetite, there is neither moral good nor evil. But insofar as they engage reason and will, there is moral good or evil in them” (no. 1773). So it is how we act based on this feeling that determines whether we sin or not. We find also in the Catechism that we should be moved to do good not only by our will but by our heart as well. In other words, we must attempt to convert our very feelings to be fully virtuous (no. 1775). St. Paul mentions outbursts of anger along with sev­eral other sins, including fornication, jealousy, enmity, and strife. He concludes with this warning: “I warn you as I warned you before, that those who do such things will not inherit the kingdom of God” (Gal. 5:20–21). What could be further from Christ’s command in the Sermon on the Mount, to “love your enemies and pray for those who persecute you” (Matt. 5:43)? He said, “I say to you that every one who is angry with his brother shall be liable to judgment; whoever insults his brother shall be liable to the council, and whoever says, ‘You fool!’ shall be liable to the fire of hell” (Matt. 5:22). This article is from a chapter in Overcoming Sinful Anger. We can suppress our anger; or we can express it by sabotaging the efforts of those who caused it; or we can express it in an irrational tirade of bad words and insults; or we can express our anger rationally — or at least process it rationally. If we merely suppress an angry feeling, it will go down into our subconscious and wait for a chance to explode. And it will explode. It is better to do something constructive with it. First, let’s consider the dysfunctional ways of dealing with the feeling of anger, the sinful ways. The first tactic in angry people is often passive-aggressive behavior. This is the way the saboteur operates. He is an­gry but does not show it directly. Instead, he shuts down. He agrees to do something but never does it. According to Dr. Daniel K. Hall-Flavin of the Mayo Clinic, spe­cific signs and symptoms of passive-aggressive behavior include: resentment and opposition to the demands of others, complaining about feeling underappreciated or cheated, procrastination, stubbornness, inefficiency, memory lapses, sullenness, irritability, and a cynical or hostile attitude. Another passive-aggressive expression of anger, often mentioned by psychologists, is the silent treatment. The basic idea is “I won’t get angry. I’ll get even.” The silent treatment is something we have all seen. “I won’t talk to you because I am unhappy with your behavior.” It may be a day, or a week, or even two weeks before the angry person opens up. One husband refused to speak to his wife for two weeks without telling her why. Finally, he admitted that it was because he had seen a spot on the wall by the kitchen table! He thought his wife should have cleaned it. The silent treatment is a symptom of bad commu­nication skills and immaturity. It usually doesn’t solve anything. Another example of passive-aggressive behavior is to do things we know will irritate the person who has an­gered us. When I was young, I had an acquaintance who would get me angry. I knew that if I did or said certain things, I could, in turn, get him so upset that he would be ready to cry. However, when I got older and was tempted to do this, I had to stop myself: “You can’t do that any­more; you’re a Christian.” I had thought I was a Christian before, but revenge is not part of the Christian’s reper­toire, so I had to make a choice: either take revenge or be a Christian. Difficult? Of course. Jesus promised a cross (Matt. 16:24). Taking revenge is sinful. So, as a first step in overcom­ing passive-aggressive anger, keep reminding yourself that you want to be a Christian, and therefore you can’t take revenge anymore. If you have a problem with exploding anger and you want to be a Christian, you absolutely must work hard to overcome it. You cannot simply say, “Well, that’s me,” if you want to be friends with the Lord. Granted, perhaps most angry outbursts are not mortal sins because sufficient reflection is absent. But choosing not to strive ardently to overcome hateful outbursts is usually done with full knowl­edge and deliberate consent of the will and so could well be a mortal sin. As with many serious sins, if we are really trying to overcome them, we can be close to God. If we are not trying, we can’t. Some seem to think that every family has blowups fairly often. This is not true. I don’t ever remember my parents getting angry at each other. They solved their problems without anger. Of course, my mother would get angry at us children, but she never was out of control. She never totally lost her temper, and she never said anything mean. (She had to get angry with us at times — but always maintaining her temper — because, as she put it, she had “three only children.”) I know many families in which uncontrolled anger is rare or nonexistent. Another dysfunctional expression of anger is illustrated by those who, filled with bitterness, continually bring up the past sins of others. They may not blow up, but they seem to be always on the verge of doing so. A wife who intended to leave her husband loaded him down with e-mails enumerating his failures of the past. This she did on the rare occasions when she did communi­cate with him. What a sad way to live. It’s the classic case of one who constantly brings up old issues, something just about every book on marriage warns against. “You made me suffer in the past, so I will make you pay for the rest of your life” is the mindset. “Forgiveness? What’s that?” this woman’s life seemed to express. Strangely she hung on to this constantly angry behavior even while praying and attending daily Mass and receiving Holy Communion. What a complete disconnect with the Christian religion! I encouraged her husband (converted, reformed, and very prayerful) to remind her that God had forgiven him. It should go without saying that if she wanted God to forgive her, she needed to forgive her husband. A person like this would do well to meditate long and hard on these words from Ephesians: “Let all bitterness and wrath and anger and clamor and slander be put away from you, with all malice, and be kind to one another, tender­hearted, forgiving one another, as God in Christ forgave you” (Eph. 4:31–32). Even more motivating should be the words of the apostle John: “He who does not love remains in death. Any one who hates his brother is a murderer, and you know that no murderer has eternal life abiding in him” (1 John 3:14–15). Those who persist in their hatred cannot hope to be anything but miserable. It can even cause them to become ill.
Editor’s note: This article is from a chapter in Fr. 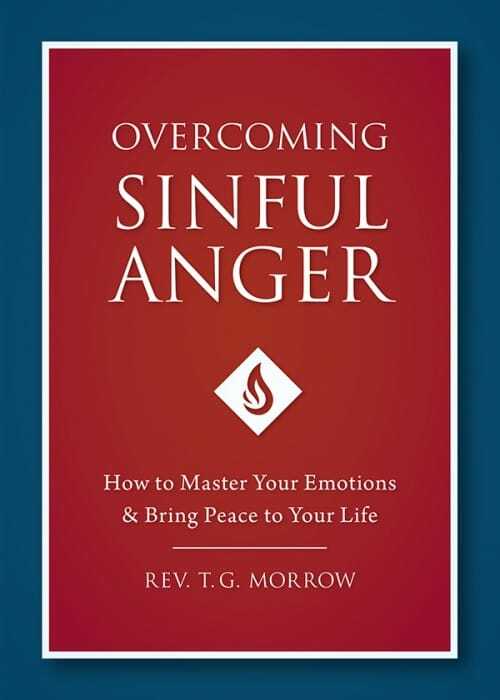 Morrow’s Overcoming Sinful Anger, which is available from Sophia Institute Press.